Chairman Jerrold Nadler (D-NY) from the House Judiciary Committee in early March released their list of conservative witnesses to be harassed in the coming weeks. The list included: Donald Trump Jr., Eric Trump, General Mike Flynn, Julian Assange, Trump son-in-law Jared Kushner, Erik Prince, Roger Stone and the NRA. On Monday Roger Stone, through his attorney Grant Smith, responded to Nadler and House Democrats. The Gateway Pundit received a copy of his response. Roger Stone “respectfully declined” any invitation for more information and/or any possible interview. I am in receipt of your March 4, 2019 letter to my client, in which the House Committee on the Judiciary requests that my client produce certain documents by March 18, 2019, with a follow up of the remainder of the requested documents at a date to be determined in the future. On the advice of counsel, Mr. Stone will not produce the documents requested by the House Committee on the Judiciary. For the reasons set forth below, Mr. Stone respectfully declines to produce any documents, and declines any potential invitation for an interview which may follow. Roger Stone added that he is no longer willing to play their game until he is declared innocent of his current process crimes… And he dunked on Crooked Hillary. As you also are aware, since the time of Mr. Stone’s testimony to the House Intelligence Committee, and principally related to the events of that day, Mr. Stone has become a defendant in a case brought by the government. As a current criminal defendant, with the presumption of innocence guaranteed to him, it is not in Mr. Stone’s best interest to participate in any additional proceedings, outside those in federal court, until the charges are resolved. Neither will Mr. Stone confirm for your Committee the existence of, or produce any documents requested, for the purpose of being used against him in anyway or to further the political agenda of people who want nothing more than to avenge the loss of their chosen candidate for president in 2016 by deposing the legally elected office holder. Roger Stone joins fellow conservative and Trump campaign official Michael Caputo in rejecting the Democrat committee’s harassment. Caputo is done with the Democrats and their endless investigations. He has consulted his lawyer and like Roger Stone he is done playing. 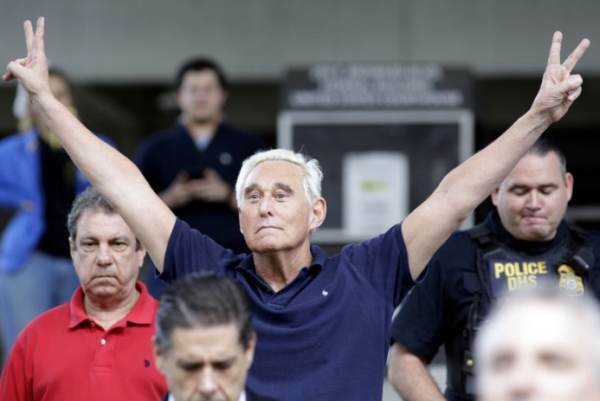 The post EXCLUSIVE: Roger Stone Responds to Nadler and House Judiciary Committee – Dunks on Crooked Hillary appeared first on The Gateway Pundit.